Alberta Justice Minister Kathleen Ganley needs to ask the Royal Canadian Mounted Police to investigate concerns raised by Alberta Election Commissioner Lorne Gibson that someone is trying to interfere with his office's inquiry into alleged irregularities in the 2017 United Conservative Party leadership race. 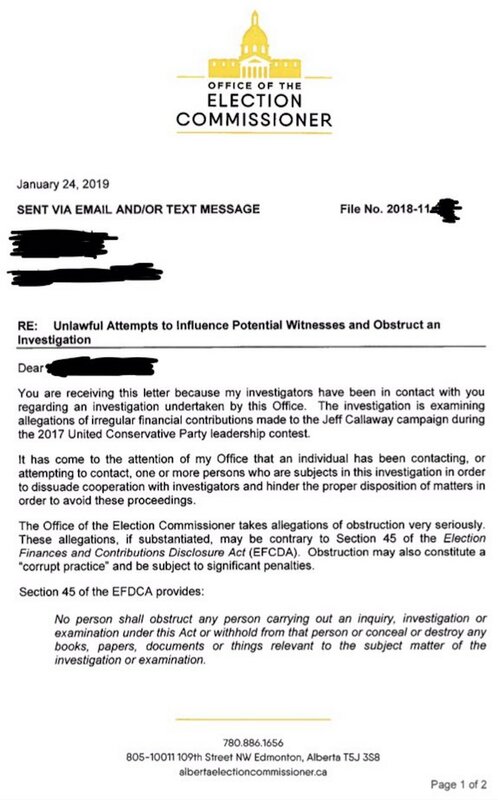 Gibson expressed his alarm in a letter Jan. 24?to participants in the investigation into allegations "irregular financial contributions" were made to the campaign of UCP leadership candidate Jeff Callaway. "It has come to the attention of my office that an individual has been contacting, or attempting to contact, one or more persons who are subjects in this investigation in order to dissuade cooperation with investigators and hinder the proper discussion of matters in order to avoid these proceedings," Gibson wrote in the letter, which was sent to several people. Ganley needs to seek police assistance because intentionally impeding the investigation is a serious matter that interferes with the work of an institution set up to protect our democratic system, and which does not have the investigative resources of a police organization. And she needs to do it immediately because, if the government changes after the general election, which is expected very soon, there can be no confidence a new government would not shut down the investigation for fear of what it might find. It must be noted here that the executive director of the UCP told Star Metro, which broke this story on Saturday, that "the party is not aware of anyone pressuring people not to participate in an Election Commissioner investigation." Janice Harrington also told Star Metro that the UCP "would encourage all Albertans, be they members or not, to abide by all laws," and said that no one among Kenney, his leadership team, or the party has been approached by investigators from the Office of the Election Commissioner. Gibson's office has hired two former police officers -- specialists in fraud and white-collar crime, one retired from the Calgary Police Service and the other from the Edmonton Police Service -- to investigate the allegations Callaway's campaign was illegally funded to carry out a "kamikaze" attack against former Wildrose Party leader Brian Jean while his principal rival, Jason Kenney, took the high road. Regardless of the merit of these allegations, which Callaway denies, Kenney, who became the leader of the Progressive Conservative Party in March 2017, was elected as leader of the UCP at the end of October 2017. He became leader of the Opposition in the Legislature in January last year. Gibson's letter warned recipients that his office "takes allegations of obstruction very seriously," and noted that "obstruction may also constitute a 'corrupt practice' and be subject to significant penalties." 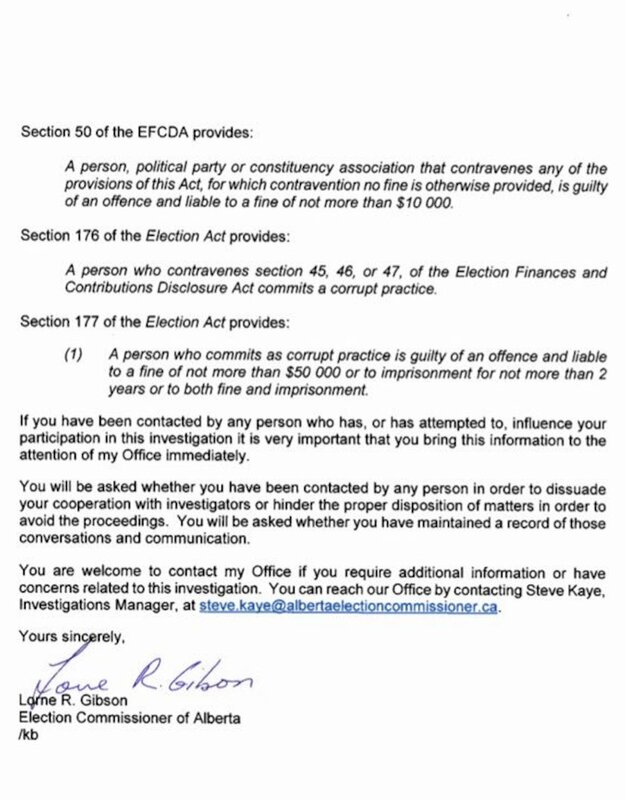 The Alberta Election Finances Disclosure and Contributions Act says no one may obstruct any person carrying out an inquiry, investigation or examination under the act. Gibson noted that anyone who commits a corrupt practice as defined by the act is subject to a fine of not more than $50,000 and imprisonment of up to two years, or both. "If you have been contacted by any person who has, or has attempted to?influence your participation in this investigation, it is very important that you bring this information to the attention of my office immediately," the letter continues. "You will be asked whether you have been contacted by any person in order to dissuade your cooperation with investigators or hinder the proper disposition of matters in order to avoid the proceedings," Gibson wrote. "You will be asked whether you have maintained a record of those conversations and communication."